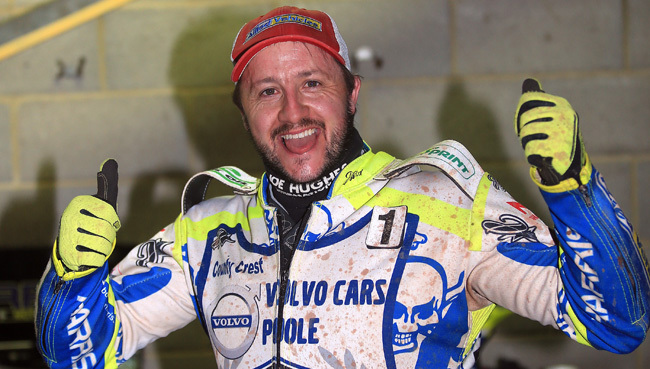 Somerset Rebels have announced two riders for their 2019 season, their 20th Anniversary year in which they will start back in the second tier of British Speedway. Garry May delighted the gathering of over 100 supporters at the Oaktree Arena on Tuesday night when he confirmed the return of Nico Covatti and the addition of Cornishmen Chris Harris to the Rebels fold. Earlier the assembly had heard that the Rebels management found themselves in a no-win situation at the AGM conference as they were keen to continue in the Premiership but a combination of costs and the need to change race nights again made it impractical to maintain their membership at the top flight. Debbie Hancock said "I am sat here this evening still gutted and feeling a sense of failure that we can't bring you the top level speedway, but our ultimate aim has to be the long-term future of Somerset speedway, something that Garry and Dad Bill, share my passion for, so I can only hope that our supporters will continue to support us. We do struggle with footfall here at Somerset because we are not a big town club like many of the Premiership rivals so we have to manage our costs carefully and we could not afford the high costs associated in that league." With a team limit of 38 points to work with for the Championship, Garry May admitted "it has been devilishly hard to work within such a limit but I promise Rebels fans I will put together the best possible team I can that will not break us as a club. I can confirm that Nico Covatti will be returning after his excellent time here last season when he came on board mid-season and I can also reveal that a deal has been done with Chris Harris who is very keen to ride for us and I believe will do a great job.